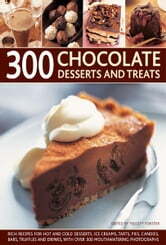 Tempt your taste buds with this inspirational collection of 300 fabulous chocoholic desserts and decadent treats. It features a delicious range of mouthwatering recipes, including hot soufflés, rich cakes, cold mousses, ice creams and sorbets, tarts, pies and cheesecakes, as well as special treats such as little cakes, slices and bars, candies and truffles, and chocolate drinks. Why not try out the classics, such as Mississippi Mud Pie, Belgian Chocolate Mousse and American Chocolate Fudge Brownies, or if youre feeling more adventurous, theres Hot Mocha Rum Soufflé, Black Forest and Kirsch Ice Cream, and Mexican Hot Chocolate all waiting for a taste. Illustrated with 300 sumptuous photographs of the finished dishes and easy-to-follow instructions to guarantee delectable results every time there is also a complete nutritional analysis for every recipe. 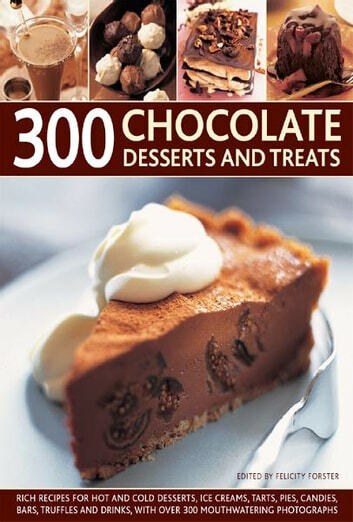 The 300 desserts and treats are illustrated with tempting photographs of the finished dishes. With detailed step-by-step instructions for every recipe, useful cook's tips and variations throughout, as well as handy, at-a-glance nutritional information on every page, this glorious book is a must for every chocoholic's kitchen bookshelf.